One of my favorite meals is ramen noodle soup. I love the delicious combination of tasty warming broth, satisfying noodles, and healthy fresh vegetables, all in one bowl. But the problem is that restaurant ramen is often very salty. As a family, we don’t eat out too often because food made away from the home tends to be heavier on the oil and salt than homemade fare. I prefer to try and recreate restaurant meals in my own kitchen. That way I know exactly what is going in to the recipe. 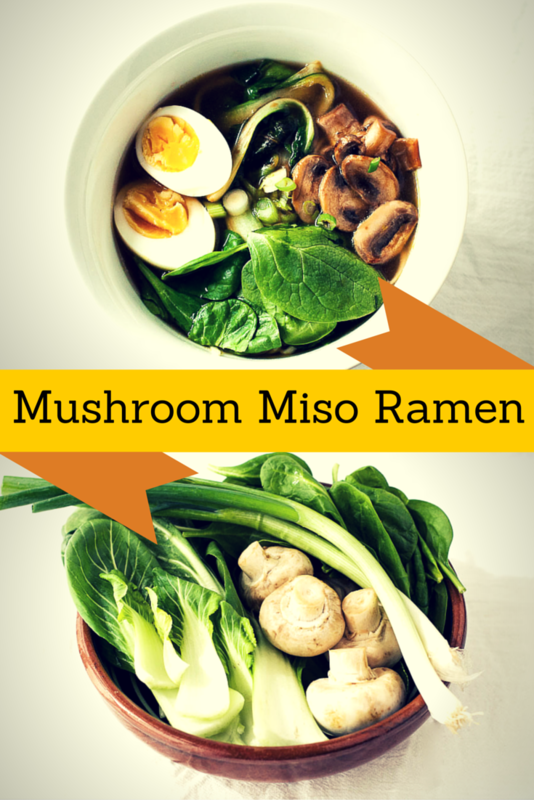 So I decided to do the same with ramen noodle soup, and came up with this healthy and delicious mushroom miso ramen. 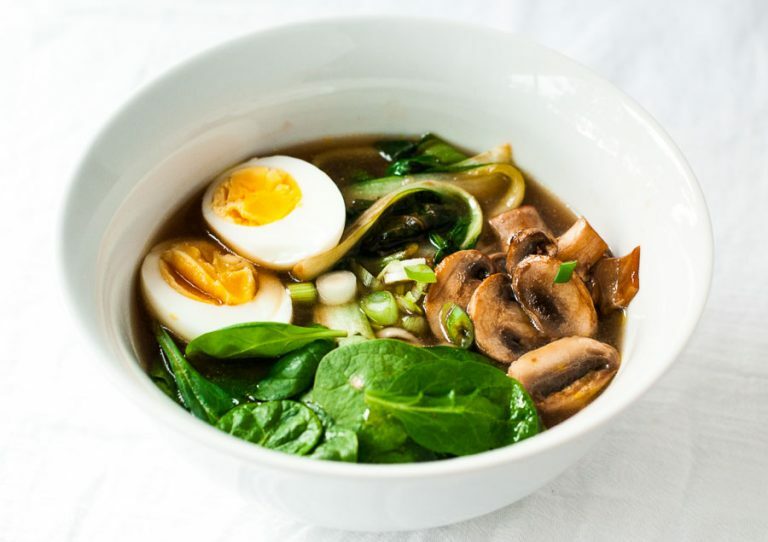 The broth is made by simmering onion, ginger, garlic, and mushrooms in vegetable or chicken stock with Tamari, fish sauce, rice vinegar, and chili flakes. After an hour of simmering, you add some miso paste and drain the broth, saving the mushrooms for serving. Miso is a fermented soybean product. It is a great source of protein, fiber, and probiotics. Probiotics, or ‘good bacteria’, help keep our gastrointestinal tract healthy. They also help strengthen our immune system, which is just what we need during the winter cold and flu season! 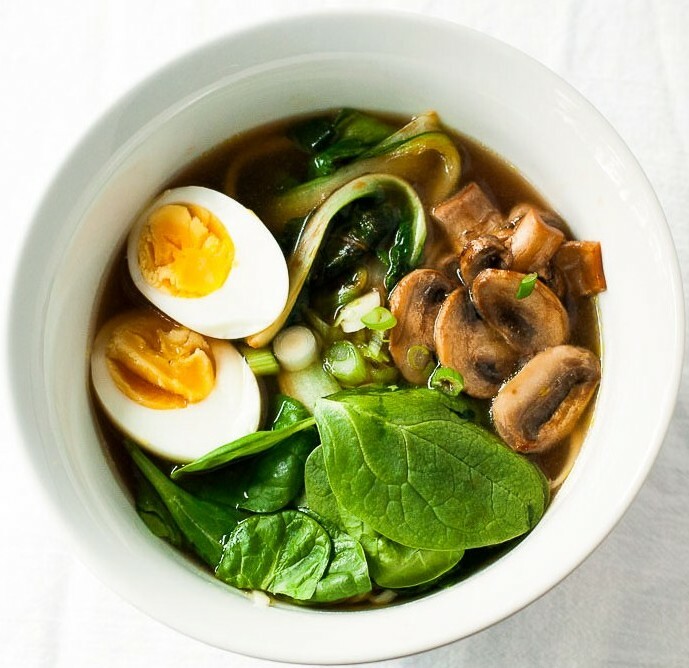 I chose to top my mushroom miso ramen with bok choy, spinach, mushrooms, scallions, and a hard boiled egg for added protein. However, you can choose any leafy green vegetables you like. You could also substitute shredded chicken for the egg. And even though you can’t see the noodles in the photographs, I promise you they are there, lurking underneath just waiting to be scooped up with my chop sticks. Heat 1 tbsp of the oil in a large pot over a medium-high heat. Add the onion and cook for about 5 minutes. Then add the garlic and ginger and cook for an additional 2 minutes. Add the broth, water, tamari, fish sauce, rice vinegar, chili flakes, and half the mushrooms. Stir well, cover, turn the heat to low, and simmer for one hour, stirring occasionally. After 1 hour, remove broth from the heat, add the 1 tbsp miso paste, taste, and add more tamari if needed. Strain the broth, but keep the mushrooms for serving. Meanwhile, cook the noodles according to the instructions on the package. Drain and set aside. Prepare the hard boiled eggs by placing in almost boiling water for 6-7 minutes. Drain and, once cooled, peel, cut in half, and set aside. 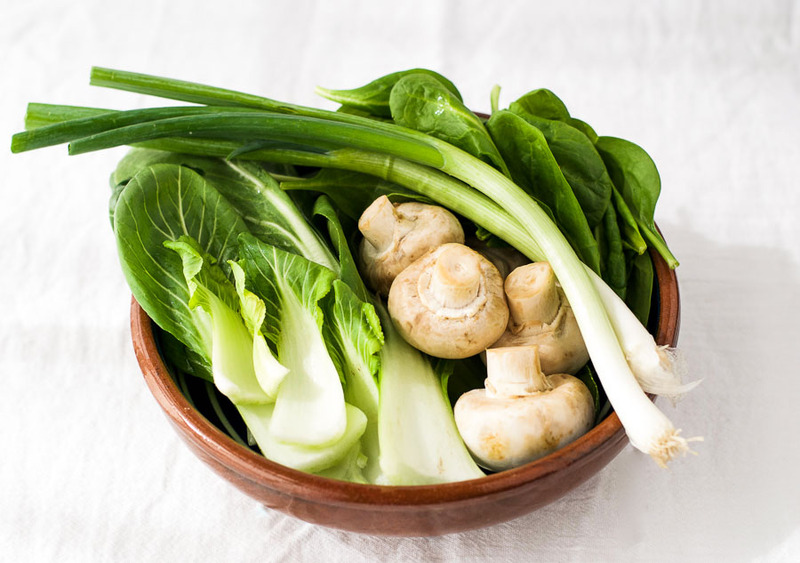 Stir fry the bok choy and remaining mushrooms in 1 tbsp of olive oil for about 3 minutes. Add the spinach and stir fry for an additional 2 minutes. Add a dash of water if it starts to stick. To serve, divide the noodles between four serving bowls. 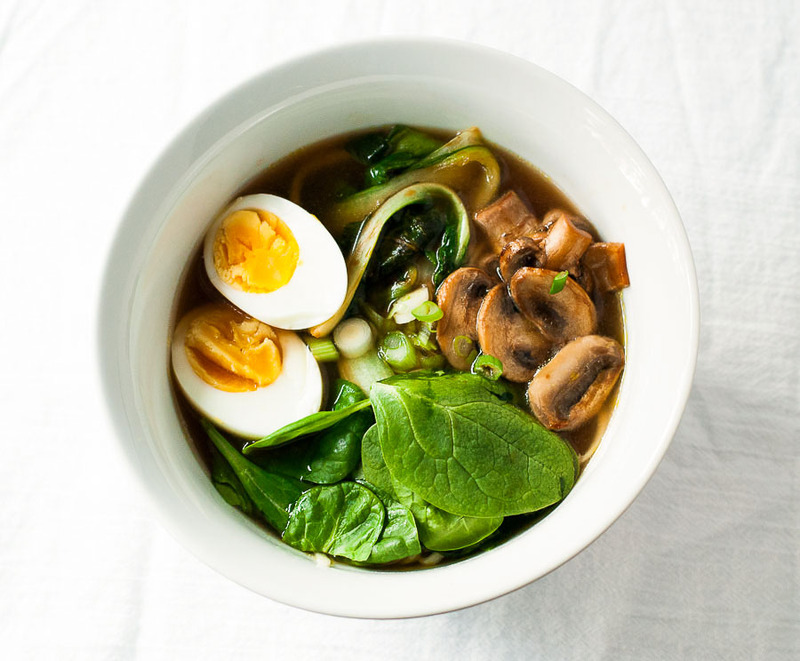 Top with the broth, bok choy, spinach, mushrooms, egg, and scallions. me too – ramen is a favourite of mine. And I agree, the ramen you can buy or eat out is so salty. This looks really good – mm, getting hungry now! Made this for dinner last night–delicious!! I added kombu to the stock before simmering for extra flavour and topped the ramen with corn & tempeh, pan fried with sesame & avocado oil.